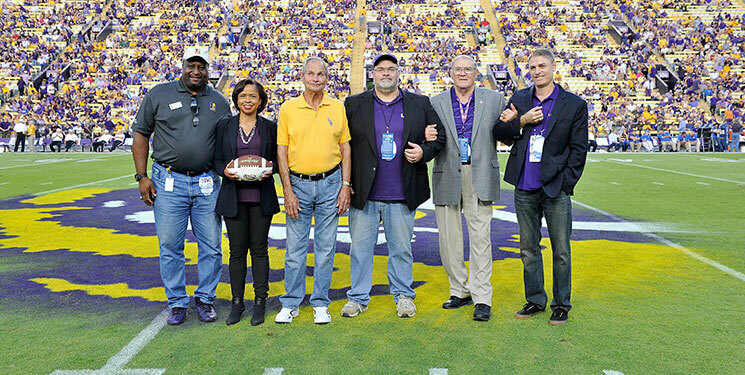 From left, Eric Reid Sr., representing the LSU National L Club; Terrie Sterling, representing game sponsor Our Lady of the Lake; Richard Granier, 1964 football MVP and guest captain; David Miller; Fred Miller, guest captain; and Jake Miller at the 2014 LSU football game against Kentucky. With a father from Homer and a mother from Marksville, Jake Miller has always had a deep connection to Louisiana, even though he is a native of Baltimore. Miller’s parents, Fred and Charlene, met during their time at LSU, at a party Charlene’s father threw for Fred’s fellow teammates on the football team then-dubbed “The Chinese Bandits.” He fell in love at first sight with the southern belle. The father of two “theatre nut” daughters, Jake created the Fred Miller Family Fund in the Department of Theatre. Having pledged to donate $1,000 annually over the next 10 years, Jake includes a giving link in his email signatures to encourage his family and friends to also give. Established in 1928, LSU’s theatre department is one of few programs nationwide that is aligned with a professional theatre (i.e., Swine Palace), allowing its students to work alongside leading industry professionals. Jake, senior vice president of Entertainment Consulting International, said many people don’t know how robust or important the program is. “Without that type of art in our lives, it’s a pretty dull place,” he shared, adding that certain cultural elements are otherwise lost. The Fred Miller Family Fund provides unrestricted support to the department to address the greatest needs at the time, which could include scholarships, equipment or a host of other opportunities.